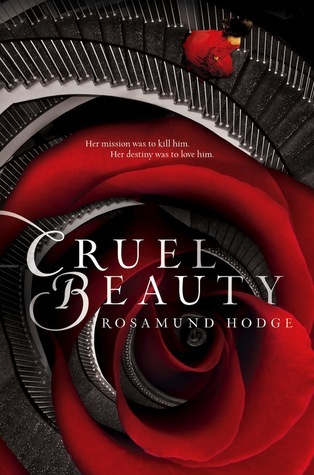 Cruel Beauty by Rosamund Hodge, published in 2014 by Balzer + Bray / HarperCollins. Book Page. Author. Goodreads. Amazon. Book Depository. Source: I downloaded a free audiobook from SYNC! Is it?!?! He looks horrifying to me. Anyway, luckily, Cruel Beauty is nothing like the Disney retelling of this classic fairy tale. Nothing at all. First of all, Nyx is far from being an innocent, wilting dreamer. She’s been raised with the knowledge that she will be sacrificed and has been preparing to try and kill her future husband (and die in the process) her entire life. She knows she’s not good and tries to hide her ire from her sister, but she’s a fighter and refuses to go down meekly. I wasn’t too fond of her sister, I have to admit, not in the beginning, where she seems so gentle and naive, and not later when she forces Nyx into a promise she doesn’t want to keep. I also felt the whole setting with the Greek mythology and the demons (and the Kindly Ones, whatever those were) was a bit wonky and complicated – but that’s just an opinion, because I generally dislike the kinds of stories where Higher Powers hold all the strings. I liked the crazy, fantastical house, though, and the idea of the “hearts” of the four elements being its inner workings. I’d love to see that house’s “heart of water”, because it sounded like a truly magical place. That said, I was really glad about what Hodge did with the love triangle in her story. All the guilt and the newfound passion that Nyx feels was quite well-executed. When I heard (this was an audiobook, after all) that there were TWO men in the house (her husband, Ignifax, and his shadowy servant/slave Shade), I had a brief “Oh, for God’s sake, not AGAIN” moment, but was pleasantly surprised with the way things turned out. I did feel, however, that the narrator, Elizabeth Knowelden, was sometimes too affected in her reading. If the story says someone “sighed” or “murmured”, I don’t necessarily need the narrator to sigh and moan to get the point across, if you get what I’m saying. Other than that, the narration was fine. So, all in all, as far as retellings of fairy tales go, Cruel Beauty is much more my style than Disney’s Beauty and the Beast, and I’ll take a flawed fighter of a heroine over a dutiful angel any day. This entry was posted in Book Review and tagged 4/5, audiobook, fantasy, YA on June 24, 2014 by Kaja. The Prince in Beauty and the Beast definitely looks better as a beast. He has such massive eyebrows as a human! Haha! How can you not love the singing though?! Crazy lady! Thanks for the comment, Hannah!